Description: The Web, digital marketing, and advertising have been revolutionized in the last few years, yet the approach to using data has remained largely the same as a decade ago. 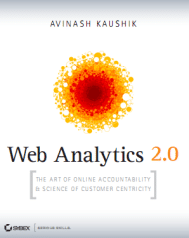 In his second book web analytics thought leader Avinash Kaushik presents the next-generation framework of web analytics in this exciting book that will dramatically enhance the ability of your organization to think smart and move fast. Avinash lays out specific strategies and execution models to evolve from simply leveraging clickstream tools to incorporating the insightful elixir of qualitative data, experimentation and testing, and competitive intelligence tools.